Repairs are generally discovered during visual inspections or mechanical and electrical tests & inspections that are conducted on installed fire sprinkler systems by actively licensed fire sprinkler companies in San Diego. Repairs are necessary for the installed fire sprinkler system to be readily operational at all times. To the right there is an image of a fualty, corroded and inoperable sprinkler head which requires repairs as an example. Many times a fire sprinkler company will not certify the fire sprinkler system is functional without the described repairs being completed. Fire sprinkler systems may have mechanical failures in valves, fire sprinklers, sprinkler heads, standpipes, fire pumps, fire service mains, hydrants, fire hose connections, FDC outlets, water tanks and water towers just to name a few devices and components that may be part of your installed fire sprinkler system. Mechanical failures should be addressed, fixed or repaired immediately to avoid safety, building and fire code violations from the City of San Diego. Fire sprinkler plumbing repairs are generally repairs to frozen, ruptured or broken fire sprinkler or standpipe lines, fire hydrants that leak, inoperable backflow preventers, valves that are rusted and corroded, sprinkler heads, FDC outlets and fire hose connections that are leaking, damaged by impact or have broken swivels or heads. All fire sprinkler repairs should be completed by actively licensed fire sprinkler companies in San Diego. Electrical repairs to fire sprinkler systems are sometimes required to troubleshoot alarms, fire control room, shorts in electrical wiring, alarm triggers, detectors or sensors and electronic controllers that may be installed as part of your fire sprinkler system. You'll want an experienced technician actively licensed to work on fire sprinklers and possibly an electrician. There are fire sprinkler companies in San Diego that carry both licenses as well as bonded and insured work they can perform. During the course of scheduled and routine maintenance that should be completed on all installed fire sprinkler systems such as quarterly (4mo), semi-annual (6mo), annual (1yr), three (3yr), five year (5yr) tests and inspections. 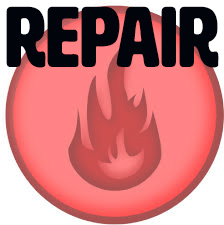 Repairs are often discovered many repairs are often minor and can be completed immediately, others may initiate you to shop and compare prices and attempt to find lower costs for the repairs required. Make sure any repairs that are performed are completed by licensed fire sprinkler companies in San Diego. Many fire sprinkler companies will carry insurance and may be bonded for any services they perform, when obtaining an estimate you can make a request for proof of bond and insurance limits if needed for permits. You can obtain estimates for installation, service and maintenance of fire sprinklers from actively licensed fire sprinkler companies in San Diego.